There was a very popular drama entitled “Daejanggeum” which depicted stories that took place in the royal kitchen. The colorful Korean food that filled the screen was attractive to the eyes. The food was based on the royal dishes which reflected Yin-Yang and five elements of Oriental thought. Today, let’s discover Korean food that is made with the ingredients harvested from Korea and which illustrates the spirit of the country. In the Oriental world (including Korea), there is a traditional theory called “Eumyangohaeng (Yin-Yang and Five elements).” What is the relationship between this Eumyangohaeng and Korean food? Diners enjoy a feast of Korean cuisine. Eumyangohaeng means that Yin-qi and Yang-qi were created to become sky and earth, then these two qi created the five elements -- wood, fire, earth, metal and water. According to the theory, white, yellow and red have Yang-qi while blue and black have Yin-qi. The five elements are represented by five colors and five bearings, which includes four directions and center. Yellow corresponds to the center, blue to the east, white to the west, red to South and black to North. The most effective way to understand this theory through food is with bibimbap. Toppings of various colors are placed on top of white rice. You can see these five colors at a glance. In one bowl, you see the Yin and Yang, and in fact, the whole universe. Gujeolpan is another example of food using the Eumyangohaeng theory, since ingredients of various colors are wrapped in a thin white wheat crepe. Modern Korean food does not always follow the spirit of Eumyangohaeng, but we can still find some restaurants serving dishes which contain the spirit of Korea and are made with ingredients grown and harvested in this land. Let us go to Insa-dong. Along the alley of Insa-dong, one of the most popular tourist attractions in Seoul, restaurants, tea houses, cafés and food stands abound. On the corner of one particular alley is Dimibang, a restaurant. The word “Dimibang” means a room where the King eats his royal meals. Kings must have eaten good food cooked with ingredients in season harvested from every corner of the Korean Peninsula. This means that the table of Dimibang is also filled with good food. “Eumsikdimibang,” the first cookbook written in Hangeul by a woman. In addition, Dimibang is the shortened title of a cookbook, “Eumsikdimibang.” Eumsikdimibang was written by a Jeong, the wife of a high ranking government official, in 1680 (the 11th year of King Hyeonjong). 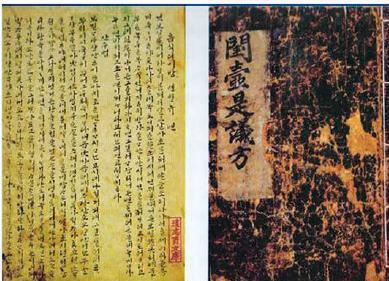 It is the first cookbook in East Asia written by a woman and in the Korean language. On the cover, the book says “Eumsikdimibang” in Korean. The title is a Sino-Korean word meaning “the ways to know flavor of food.” The book introduced recipes passed down through generations, Jeong’s own recipes, and recipes for special food enjoyed in noble families. In addition, it recorded flour-based food, rice cakes, fish and meat dishes, and how to brew traditional alcoholic beverages in detail. This book provides enough information for us to understand the philosophy pursued by the restaurant Dimibang. The restaurant itself is very humble, so some people may be disappointed with the appearance of the restaurant. Bibimbap is said to contain the whole universe. However, you will be surprised when you sit at a table. This restaurant is the only medicinal herb restaurant in Korea, where the medicinal herb specialist Choi Jin-gyu, president of Korean Native Medicinal Herb Institute, provides nature-friendly food made based on his experience and knowledge of herbs. The restaurant not only serves seasonal ingredients but also healthy herbal food in the Korean style. Choi is famous for his book on folk medicines, and for being a third generation herbalist. He collects most of the herbs served on the table himself, from mountains such as Jirisan, Palgongsan, and Odaesan. Dimibang never uses meat or MSGs, and the food is seasoned naturally with shitake mushrooms, sea kelp, garlic, onion or horseradish. When we look at the menu of Dimibang, most of foods are those we have hardly heard of. It also offers course meals named Dimibang Jeongsik, Namul Jeongsik, and Hamcho Jeongsik. The menu changes slightly according to the season. Let’s explore some of the dishes served at Dimibang. The first dish served is porridge. It is hasuo (pleuropterus multflorus) porridge. Hasuo is a subterranean stem like sweet potato, and it is said that it will make gray hair black again. The porridge made with hasuo and brown sweet rice is soft and delicious. Then, madeulkkaetang is served. Since it is made with perilla seeds and yam, it is very flavorful. Next are hamcho salad and hamcho rice. Hamcho is glasswort that grows in salty mud flats on the west coast of Korea. We can feel its unique texture when chewing it. Dimibang has created various dishes using glasswort which is rich in minerals. Samsaekjeon, jeon with three colors, is not only attractive but also healthful since the food coloring comes from vegetables like pumpkin, beet, and spinach. Prices are as follows; 13,000 won for Dimibang Jeongsik, 23,000 won for Namul Jeongsik and 35,000 won for Hamcho Jeongsik. 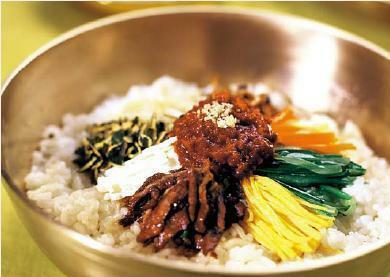 In addition to course meals, Hamcho Bibimbap, mistletoe herbal rice and others are served a la carte. Dimibang is open from noon to 10 p.m. Last order is at 9 p.m. Telephone (02) 720-2417, 84-14 Gwanhun-dong, Jongno-gu, Seoul. Korea House is located next to Namsangol Hanok Village, at the site of the residence of Bak Paeng-nyeon, a famous scholar in the Joseon Dynasty. 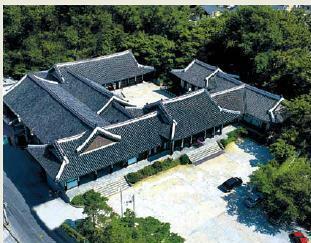 An Important Intangible Cultural Heritage, master carpenter Sin Eung-su built the Korea House building modeled after Jagyeongjeon of Gyeongbokgung. Korea House is a multicultural space where you can enjoy the beauty of Korean culture. Since it serves traditional Korean royal cuisine which is pleasing to the eyes as well as to the palate, fans of the drama “Daejanggeum” from 60 countries around the world including Japan, Hong Kong, Turkey, and Hungary, visit Korea House. Korea House also provides regular performances of pansori and fan dances as well as cultural experiences such as kimchi making. Korea House (02) 2266-9101. For a wonderful cultural experience, visit http://www.koreahouse.or.kr. In the summer of 2004, this restaurant opened under the sign of “Jo and Lee’s Diner,” but changed its name to Soseonjae. It is a Korean restaurant that close neighbors, Ms. Jo and Ms. Lee, opened together. Soseonjae features natural cuisine and serves wild vegetable salad, boiled pork with groundsel, shrimp soup and steamed octopus. Soseonjae uses its own seasoning by fermenting fruits and flowers of the fields and mountains. The Hanok building is the perfect setting for the food they serve. For reservations, call (02) 730-7002. Sanchon specializes in traditional temple food. You can enjoy authentic temple food in the center of Seoul. The best menu items of Sanchon are, Bing, buckwheat wrap with various vegetables including radish and mushroom, Sanche Modeumnamul served with seven wild vegetables seasoned with different seasonings, and Dubujjim (steamed seasoned tofu) with various toppings. Vegetarian japchae with deep fried vegetables in season and jeon are very popular, too. During the evening, traditional cultural performances are presented with meals, which allows you to enjoy various aspects of Korean culture. Sanchon upholds the tradition of temple food, restricting the use of red pepper (except in kimchi), MSG, and meat. For reservations, call 735-0312. In the Oriental world (including Korea), the theory of “Eumyangohaeng (Yin-Yang and the five Elements)” has a strong influence on many parts of people’s lives. The theory of Eumyangohaeng interprets all phenomena we face in birth, life and death through Yin, Yang, and the five elements derived from Yin and Yang -- water, fire, wood, metal and earth. The five elements are expressed in five colors, which also symbolize seasons, bearings, body parts, emotion and intelligence, taste and food ingredients.